A few weeks back I wrote about children in Australian immigration detention. Sadly, nothing much has changed since then. This week, however, Amnesty International launched a brilliant new campaign. One of my dad's many talents is being able to fart on cue. When I was a kid and he did this, I thought it was absolutely roll-around-on-the-floor hilarious. Last week when he did it—not so much. But for dad, it’s not the flatulence by itself that makes it funny—there's an art to its delivery. It’s all about timing and context. Dad and I argue about politics pretty much every time we see each other. He leans a little to the right; I pull to the left. If you’ve read Rabbit Hole before, you can imagine in an argument how much of a 'I-think-I-know-it-all' insufferable bore I can be. Dad and I will be going 'hammer and tongs' until I feel I have no other choice but to retrieve some fact or figure buried deep in my memory (which I usually get wrong), or fumble to remember a quote from someone famous like Noam Chomsky ("If you believe in freedom of speech, you believe in freedom of speech for views you don't like”), Martin Luther King (“All we say to America is be true to what you said on paper”), or Nietzsche (“He who fights with monsters should be careful lest he become a monster”) to tip the debate in my favour and to impress dad with how smart I am. "Australians are urged to give what kids in detention are being denied: happy childhood memories, as part of Amnesty International’s ‘Lost Children’ campaign. [...] 107 children are detained on Nauru. More than 60 children are detained in Australia, awaiting their return to Nauru. The conditions and treatment they experience are hidden from sight but recent reports by the Australian Human Rights Commission and the Moss Inquiry have revealed widespread abuse of children in detention. [...] Share a memory and speak up for children in detention"
The campaign is brilliant idea. On Amnesty’s website you can see what other people have posted. Most are only a few sentences. “Playing street football with my friends until we get tired” is one. “Eating ice cream on Sundays with my family” is another. They’re like little haikus or kōans—you know, the sense of awe inspired by considering the sound of one hand clapping. Whatever the setting, each memory bursts with vividness, fragrance, light and warmth. It's a great idea. For most of us fortunate to live in this lucky country, reflecting back on our childhoods helps put the debate into the proper context. These are kids. They shouldn't be made to pay for 'crimes' some people in our country erroneously think their parents committed. Plus—does it really need saying again?—most of us are either from, or lay claim to, somewhere else. So for this issue of Rabbit Hole, I thought I’d share a few of my memories. When I was really young, I thought dad was a magician. I can still see him with that sense of awe I saw him with then. Mum and dad ran an amateur theatre company in the small bogan-backwater-sprawling-suburb where we lived. No one asked them to do it, they just thought it up and did it, and tonnes of people who lived around them joined in and helped. Everyone acted in the shows, built sets, manned the box office and the refreshment counter—whatever needed doing. Before each new show or pantomime, our front and backyard were turned into a makeshift-workshop-busy-bee-wonderland. Twenty or so people would be swarming around all day, painting backdrops, building flats, making props. And I would be right in the middle of the tumult, getting underfoot and watching my dad orchestrate the whole thing. He would draw out a big forest scene on huge sheet of canvas, and others would paint it. Or someone would say, “Sh*t, we haven’t made Cinderella’s carriage", and dad wouldsketch one out and before the end of the day, Vrooom!— a life-sized version you could sit in would be standing there made out of cardboard and Masonite, all freshly painted with leftover tins of house paint people had donated. I wrote songs too as a kid. Well, just one. The inspiration came at primary school. Recess had just started when suddenly "Down Under" by Men at Work erupted over the PA. Australia had just won the America’s Cup. At first I didn’t really understand what was going on—I was very young—but all the older kids were going nuts, jumping up and down and hugging each other. Pretty soon I caught the feeling too, and at the time I thought the song was way cool. That day or the next, I was walking home from school and I came up with my own song about the Australia II victory. The first couple of lines and a melody just popped into my head. I sang it to myself all the way home so I wouldn’t forget it. I sang it to my mum, asking her “Is this a song, or did I make it up?” She said no, she’d never heard it before. Later that night we went to my nanna’s and by then I had written the first four lines. That night, no joke, the whole family gathered around the kitchen table and helped me finish the song. I can remember the sound of crickets in the hot evening as everyone sat quietly trying to think of the next lyric. Then someone would suggest something and everyone would shout it down as stupid, and laugh riotously. The next day I had the chorus and two full verses, and nanna helped me type the lyrics out on her typewriter. When the weekend was over, I took the typed pages to school to show my teacher. As you can imagine—I was pretty chuffed with myself! But it wasn’t just about the song. That period was the first time I finally felt at home in this country. My parents are English but I was born here. Mum and dad were the very picture of ‘whinging poms’. They were always complaining about how poorly things were done here and how it was better back home in England. And they were militant about me 'speaking properly' without an Australian drawl, which of course made me catnip to bullies at school. But from that day on, I felt I belonged here, and winning the America’s Cup solidified something in the popular consciousness in this country too. The following year in 1984, a new National anthem was introduced, and the whole country had to stop singing "God save the Queen." Suddenly Australia was a nation surrounded by sea. We had beaten the Americans in a friendly test of wits and strength, and we no longer needed to be tugged along in England’s wake. Australia gets the America's Cup. We get a dog. Around the same time we got a dog. Her name was Gee-zee-bee (don't ask me why) and she was a basset hound. Gee-zee-bee was adopted too. The family doctor who had helped guide mum and dad through the process of adopting me, also told them about someone he knew who was going through a bitter divorce. They didn't want the family dog anymore, so one day this guy pulls up at our house, opens the door and this dog with huge long ears and an even longer face stares out at us from the passenger seat. The guy didn't even pull into the driveway or get out—he just sat in the car at the kerb with the engine running and tried to push the dog out. But the dog wouldn't budge. Then I had this idea. I probably got it from watching cartoons. I went back inside and got the bag of dry dog biscuits we had bought, and placed a trail of biscuits from the car to our front door. Gee-zee-bee hopped down and started eating. By the time she made it in the house, we were best friends forever. Every one of these memories fills me with warmth and a sense of belonging. I belong—and that's a pretty significant thing for an adopted person to feel and say. Apart from the the traditional custodians of this land, the irony is most of us who live here are from somewhere else, or else born by others who have strong ties elsewhere. Australia is largely a nation of boat people who have no more right to claim this country as their own than the people they’re trying to keep out. We’re a nation of boat people dreaming we belong. It's all a question of narrative—and changing certain narratives is the only way we're going to see change in this country. I keep thinking about Prime Minister Tony Abbott recently eating two raw onions. My instinct is that once he took the first bite, he realised that it tasted awful and the whole thing was a mistake. But not only did he finish the first one, he did it a second time to prove he really meant to do it. Our Prime Minster believes that his Government should be congratulated for 'stopping the boats' and saving lives, and sometimes I wonder if all the criticism is having the opposite effect. There are growing calls for members of the Government to be prosecuted by the International Criminal Court for crimes against humanity—which I agree should be seriously explored. However, in the short term, more than 160 children are in detention and our Prime Minister is biting down hard on the onion, refusing to admit his mistake. This is not just the Liberal Party's mistake, but Labor's too, and failures of leadership on both sides abound. Which is why I think Amnesty's campaign is so great. It's a radical approach to changing the narrative. People sharing their childhood memories blows things into proportion and highlights the cognitive dissonance required to believe that locking children up is in their best interests. Rather than playing street cricket and collecting bugs in jars, these children are staring at cold walls, or worse, directly being preyed upon in unsafe environments. This issue should be exempt from politics and partisanship. Protecting children from physical, mental and sexual abuse is something we all agree on. If you feel the same about children in immigration detention, please consider joining Amnesty International's Share a memory online petition (and maybe even share your story below or on Facebook). 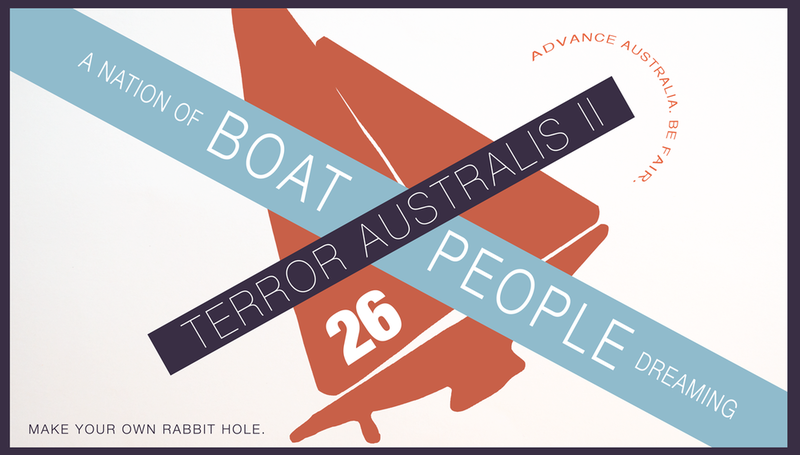 You might also like the first installment on this subject, Rabbit Hole #22 — "Terror Australis: Children in Detention".